One of the many benefits for wedding couples using AllSeated’s tools is that they have a way to efficiently collaborate with their wedding venue planner. Wedding couples today are turning towards collaborative platforms and digital tools for their wedding planning needs. There are many amazing wedding planning features available to you within AllSeated that will benefit venue collaboration and working with your wedding venue planner. AllSeated provides functionality, organization and attention to detail all in one place, eliminating the need for spreadsheets, PDF files and scattered papers of floorplan drawings! With all information updated in real time, the collaborative benefits of working with your wedding venue planner in AllSeated will assist in creating a seamless planning process and flawless execution of the reception details. Before thinking about the many tasks on your wedding planning list, start with establishing your guest list. Creating the wedding guest list should be the very first step in the wedding planning process. 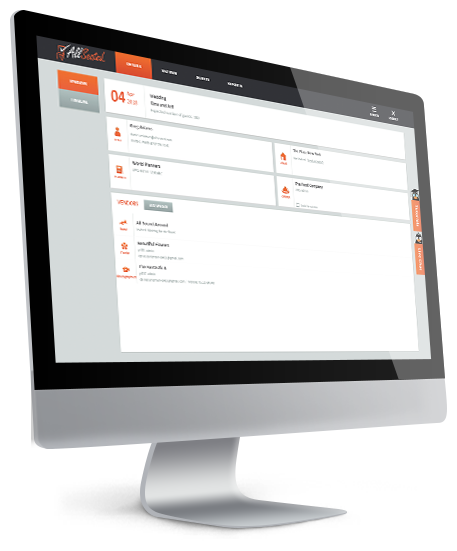 AllSeated provides you with access to a start of the art guest list tool for easy guest list management. Easily enter and organize guest names and mailing addresses. Names can be stored alphabetically or in groups. The guest list is also a place where you can list meal type requests, keep notes, and track RSVP’s. When you are ready to work with your wedding reception planner on the floorplan and seating chart, the guest list links directly to seating section which makes it easy and efficient to seat guests at the tables arranged in your floorplan. Easily design your wedding floorplan to scale within your AllSeated account. AllSeated gives you peace of mind as all floorplans and furniture pieces are built to-scale. Collaborating with your wedding venue planner on your floorplan layout and seating arrangements ensures that your expectations are met the day of your event. While most venues already have their floorplans available within AllSeated, in the event that you cannot locate your venue’s floorplan, it can be easily uploaded into the platform. Simply provide us with a floorplan marked with at least one accurate dimension and our team will scale and upload the floorplan, making it available for you to use. Your wedding venue planner already knows that providing you with floorplans featuring different set-up ideas as well as specific placement for tables, chairs, and even extras like buffet tables or entertainment can help you to visualize your event. Invite your wedding venue planner into the event so that they may show you their ideas using AllSeated’s vast furniture library. As you work collaboratively on creating the floorplan, you will have the ability to customize the spacing between tables, number of chairs around each table, table numbers, and table assignments. As you design your wedding floorplan layout, feel free to switch views from 2D to 3D to take a tour of your floorplan. 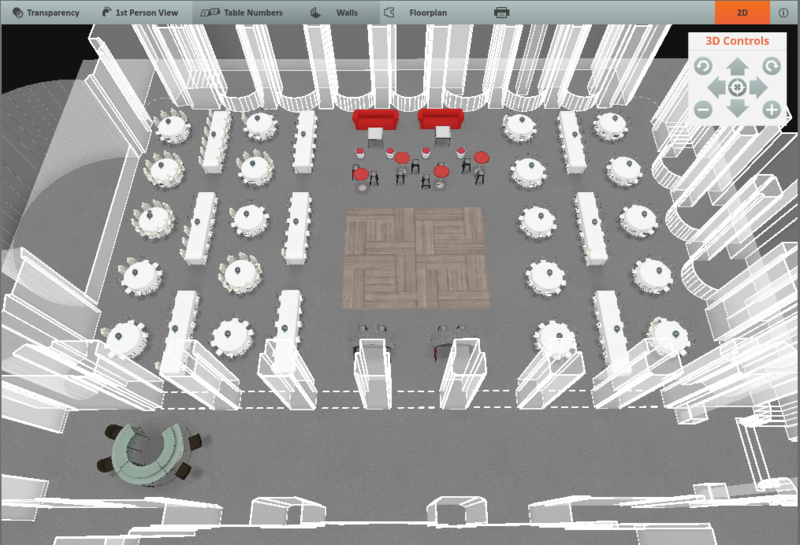 Using AllSeated’s 3D tool, you are able to create a virtual walk through of your event. There are various 3D floorplan viewing options. Bird’s Eye viewing allows you to see your floorplan in 3D from an above view. Alternatively, you can also walk through the layout via 1st Person View as if you were taking a virtual walkthrough of your floorplan. The many forms of 3D viewing help to ensure that you’re 100% satisfied with the layout in advance of the event. Take your floorplan a step further during the planning by viewing it in virtual reality! 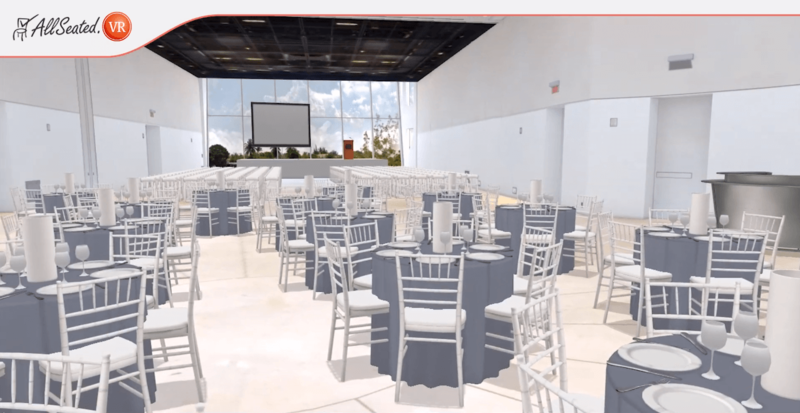 By using special virtual reality goggles, you will be able to virtually tour the 3D floorplan layout for your wedding in a realistic simulation. Learn more about AllSeated’s Virtual Reality and the three easy steps for getting started here. Easily build the tabletop and buffet displays to-scale within your floorplans using AllSeated’s designer tools! With the use of the designer tools, see exactly what will fit to-scale on tabletops and buffets, meaning no more guess work! This is another wonderful option for collaboration with your wedding reception planner and other vendors such as decor team and florist. Using the designer tools, allow them to show you what your tabletops will look like within the floorplan! Easily arrange your seating chart within your AllSeated account. Since your guest list will link directly to seating, you will be able to select guests and place them at the tables within your floorplan. You can even assign guests to specific seats at each table if you choose to do so. If you aren’t sure where you wish to seat your guests, the collaborative benefit of using AllSeated allows you to invite your entourage in to help you make decisions! The reports feature is a wonderful benefit when working with your wedding venue planner! You will be able to generate many useful reports that will assist your wedding venue planner in setting up your reception according to your planning details. Easily generate a floorplan report to detail your specific layout. This report will include a detailed listing of inventory, table breakdown and seating information. A guest report can also be generated to include details such as meal types, table numbers and any other information relevant to include for your wedding venue planner. Creating a vendor timeline within your account is helpful for venue collaboration among all vendors involved on your event. A vendor timeline will keep all vendors, including your wedding event planner, up to date on details for the day of the wedding. You may also wish to share your personal day-of timeline with your wedding venue planner so that they are made aware of your own personal wedding day schedule. Timelines can be viewed side by side for even more organization. AllSeated’s Day-Of Mobile App for tablets includes a mobile check-in system, real-time collaboration, live check-in updates, overview of check-in status, and the ability to view your wedding floorplan in both 2D and 3D. Useful for your wedding event planner, the Day-Of Mobile App gives access to the master seating chart and allows you to let your guests know where they are sitting while also keeping track of who is in attendance. AllSeated’s Virtual Reality technology is the event industry’s first and only genuine virtual reality capability. For venues that utilize this technology which features seamless and photorealistic 3D renderings, clients are able to take a virtual walkthrough of the venue and their expected event layouts from wherever they are, rather than needing to be physically at the venue to tour the space. Through the use of a VR headset or by viewing the VR widget placed on a venue’s website, visitors can tour a venue in 360 degrees, preview their tables and furniture, and even view a custom setup in virtual reality to experience a lifelike visualization of their desired event layout. Virtual reality makes it easy to sell your venue’s potential, eliminates the need for on-site inspections, and allows you to close more business from anywhere in the world.